For a dose of John Holland history visit the museum at Broomehill before hitting the road towards the town of Nyabing. You’ll pass by Lake Grace, a shallow salt lake with a suberb lookout over the surrounding countryside and springtime wildflowers. Continue through rich farmland, taking in Holland Soak and Silver Wattle Hill before arriving in the town of Newdegate. Stay overnight at the Holland Track Farm which offers guided and camping tours. Explore Emu Rock before crossing the Rabbit Proof Fence. 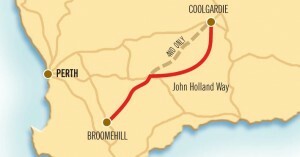 If you’re in a two wheel drive, continue along the John Holland Way towards Coolgardie. Stay overnight at The Breakaways Camping area. For a real outback four-wheel adventure there is the option of the Holland Track beginning in Hyden. This route slices through natural bushland and past stunning rock formations. Camp out under the stars at Sandalwood camp. Today we complete our epic journey through the remote outback – enjoy vistas of virgin bush, salt lakes, nature reserves and granite outcrops. The John Holland Way and the Holland Track meet up near Pigeon Hole Rock for the final leg to Coolgardie. Spend a few days exploring Coolgardie’s rich mining heritage. The Holland Track – Western Australia's Ultimate 4WD Adventure!